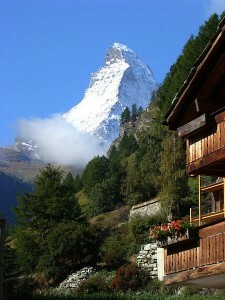 So it is with the sleepy town of Zermatt in Switzerland, home to one of the most dangerous peaks in the world, the Matterhorn! Whether people have seen this mountain up close and personal, or just been witness to its beauty through pictures, the mountain and its shape are iconic and the mere 4,478 metres to the top(14,692 ft.) makes it among the top 10 highest mountains in Switzerland. The mountain is easily recognizable for the 4 faces that seem to point to the 4 major directions on the compass. First climbed on July 14, 1865 it ascent went smoothly but the descent was tragic. An Englishman, Edward Whymper, along with Charles Hudson, Lord Francis Douglas and Douglas Hadow and three guides(Croz, and father and son team Peter and Peter Taugwalder jr) conquered the mountain but on the descent, Hadow slipped, knocking Croz (one of the guides) off the mountain face and then following right behind, Hudson and Douglas tethered by ropes followed down the north face of the mountain to their deaths. The two Taugwalders, and Whymper managed to make it back down the face of the mountain, because the rope that tethered them all together snapped. While this was not a good thing in general, in this case, it was lifesaving and the reason that these three managed to make their way back down the mountain. Every year the mountain claims some lives. The Matterhorn is not for the uninitiated climber, rather it is a mountain that requires respect and strength from those who would take its challenge. To make it to the top and back down again takes about 10 hours for the experienced climber. Most of the climb is rocky and exposed to the elements. The climb has been done in much less time, by those who would be considered “speed climbers”. In 2013 a Catalan mountain climber/racer, 25 year old, Kilian Jornet, set a new speed record of 2 hours 52 minutes and 2 seconds, to go up and come down the mountain. That time, shattered the record set by Italian Bruno Brunod in 1995. Most people that climb are not speed climbers, they do however, have lots of climbing experience. Yet the mountain does claim about 12 deaths annually. Most of these are due to falls, inexperience, underestimation of the mountain, bad weather and falling rocks. If you have never travelled to Switzerland before, you might like to make the effort to get there this year. The Canton of Valais and the town of Zermatt will be hosting many special events to celebrate the 150th anniversary of that first climb. Mountain climbing is not the only activity to do in Zermatt, there are many wonderful places to bike, hike, take a tram, or a lift and just enjoy the beauty of the Mountains all around.